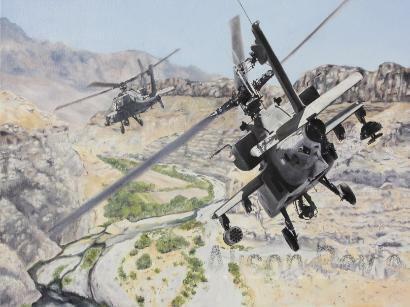 On November 13th a painting titled "Answering the Call,'' depicting two Apaches flying in formation above Afghanistan terrain, will hang in the United States Army Aviation Museum at Fort Rucker. Vanessa Cole, her 10-year-old son, Carson, and Brent's mother, Helen Cole, will attend the ceremony. Proceeds from prints of the painting will go to an education fund for Carson. Prints are for sale online at www.alisonboyleart.com/ AnsweringtheCall.html. The painting was done by artist Alison Boyle. Maj. Lee Fennema, her husband, was Brent Cole's company commander. "I was overwhelmed that somebody would do something like this,'' Vanessa Cole said. "I thought it was beautiful. She went to great lengths to make it realistic.'' "I'm honored they would do something in Brent's memory,'' Vanessa Cole said.